I will do two posts on this, as I have too many pictures for one post. The picture shows the scale ( size) of the print with the tape across it. The scale involves not just the size of the flowers or print, but the distance between the flowers. If you remember that a bodice for a 14″ doll, for example, is only about 3-4″ from sleeve seam to sleeve seam, you can see that if the major design or flowers are 2″ or more apart– the bodice will look pretty blank, and the skirt won’t have very many flowers either. 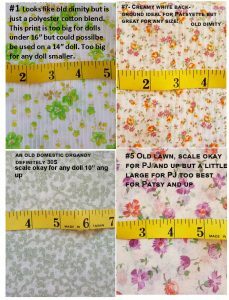 For an 8 or 9″ doll, you need a pretty small print to get more than one item on the bodice! Check out the picture, each fabric has comments printed on it. 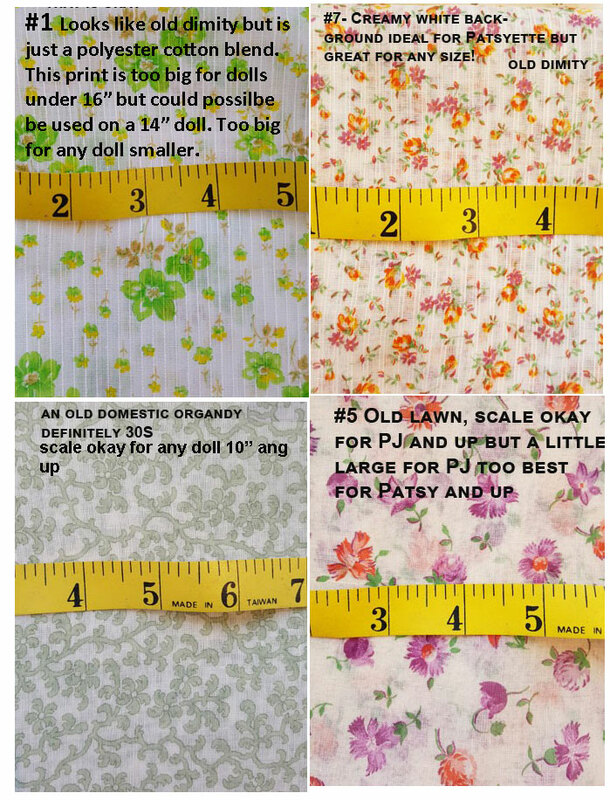 The dolls referred to on some of the prints are Patsy Family dolls, Patsyette is 9″ and PJ–Patsy Junior—is 11″ There will be another set of fabrics in the next post. Please feel free to leave comments or questions. You will NOT recieve unwanted emails– comments are answered on the Blog, and your information is confidential.